Rockin Soils was in October 2016 in Nicaragua to assist the Union of Cooperatives COSATIN with the optimization of organic fertilizers. To assess raw materials, improve the production process and optimize the quality control system to increase the quality of the organic fertilizers. Growing organic Coffee in Nicaragua, between 700 and 1000m altitude is challenging. Sometimes it does not rain in months and suddenly a storm can leave easily 20 mm in few hours. This erratic tropical weather is often worsen by periodic events like “el niño”. With all these extreme events, the fragile volcanic soils struggle to keep in shape. The Farmers of Boaco rely on coffee, ginger and turmeric as main cash crops and they also grow many other fruits and vegetables for own consumption. Farmers know best how to make compost though they find difficult to access to raw materials and often do not get the time/space to produce it. They rather buy it from somebody they trust. This reliable compost provider in Boaco is the Farmers Union Tierra Nueva. Tierra Nueva is well known in the country for their good quality organic coffee. It is an impressive good coffee that grows at less than 1000m of altitude. Their organic coffee is sold in small scale shops over the whole country under the brand Lo Sano. Actually a lot of their coffee is reaching European shops. Looking ahead in the future, the Union decided to cover the demand for affordable top quality organic fertilizers. Few years ago they started a composting project. Now they have a composting plant and will be able to provide with organic fertilizer to hundreds of farmers of the area. Dutch flower farmers in Ethiopia work with local miners to re-mineralize exhausted soils and use farm waste to make organic fertilizers. Rocking Soils works in Dutch-Ethiopian flower farms. These farms operate often in erosive soils with low fertility levels. Fertilizer is their largest production cost. At the same time they face problems to process their organic waste. The quality standards of the flower export market are high. More than 30% of the produced flowers are broken or damaged in some way and are rejected at the farm. More flowers break on their way to the airport and will not reach Europe. Finding good cheap resources to feed soil’s system is a profitable venture. Composting broken flowers is a new trend. Compost enriched with rock dust improves the soil quality of these farms and minimize the need for other inputs to correct nutrient deficiencies and combat pests. In Holleta, we work at a 25 ha farm employing 550 Ethiopian workers. 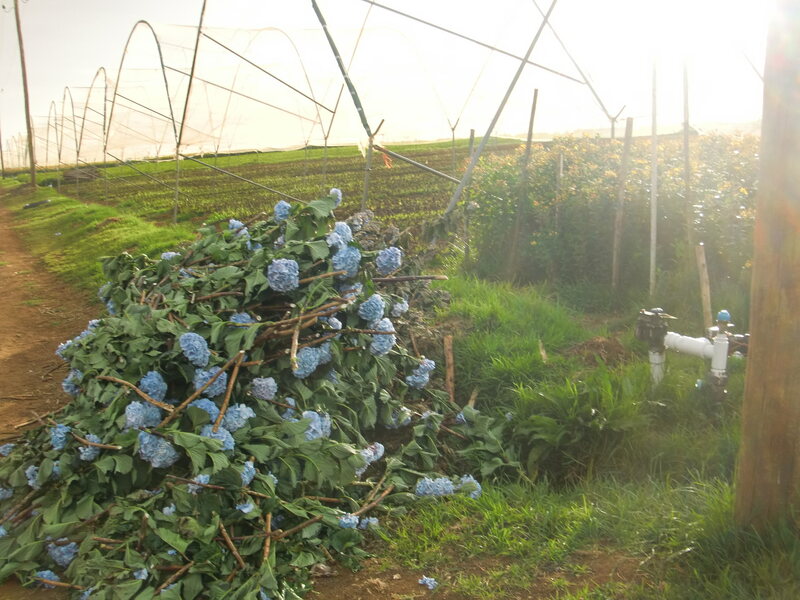 The farm produces Hypericum, Eryngium and Hydrangea and is implementing a program to produce most of their inputs by composting and fermenting waste and prepare mineral solutions. This program will improve soil fertility, reduce costs and create a toxic-free working environment. More and more Dutch and Ethiopian farmers see the returns of this system. The impact of this project goes beyond the borders of the farm. Each of the 550 workers have small family farms back home. Family farms are the backbone of the local food supply chain. These farmers are learning to use local resources to grow their food and feed their families with healthy and affordable food.